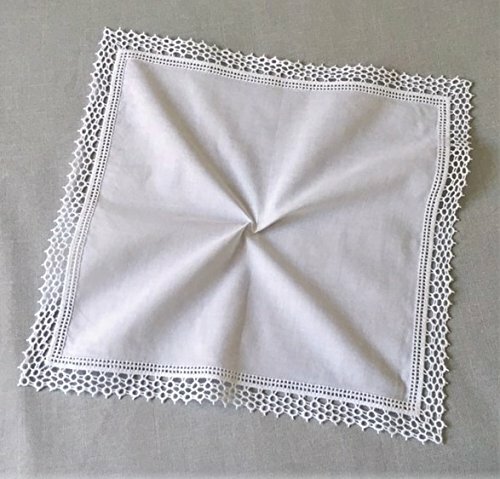 This classic white handkerchief is made of 100% cotton (Bother solid fabric and lace). A lovely honeycomb lace trim surrounds the edge. It is a perfect accent piece for any special occasion such as a wedding gift for the bride, bridemaids, mother of bride, mother of the groom or for dressing up a fine outfit. Embroidered monogram can be added on solid fabric. For best care, press after machine or hand washing. Quantity: 1 piece. Material: cotton, soft and smooth. Color: White. Item Measurement: 12"x12"
Simple and elegant design, good for monogramming and adding embroidery wording. For personalized handkerchief, please visit our Amazon Handmade storefront by searching keyword: MyButterflyHankies. For more style option, please click our display name ' By MyButterflyBasket ' below listing title. If you have any questions about this product by MyButterflyhankies, contact us by completing and submitting the form below. If you are looking for a specif part number, please include it with your message. Wedding items.Friendship(Kumihimo) bracelet(small red) of Hida(Japanese ). [Your Name.] holy place, the handcraft of the craftsman of Hida.